Oooh back to real life! I’m actually still making my way back to Montana, but plan to hit the ground running on Monday! Literally. I need to be running like a crazy person for the next 6 weeks. Something to fuel my running? PIZZA! Even better? 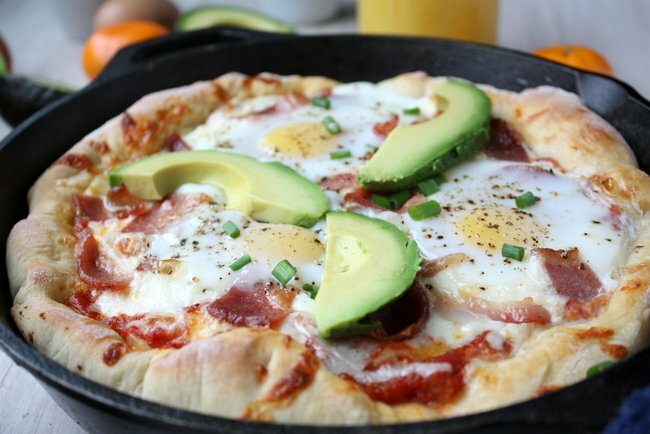 Skillet breakfast pizza! Remember how I told you that I sometimes use a little checklist on my computer to get things done? Well, I think I also mentioned how sometimes I ignore it. 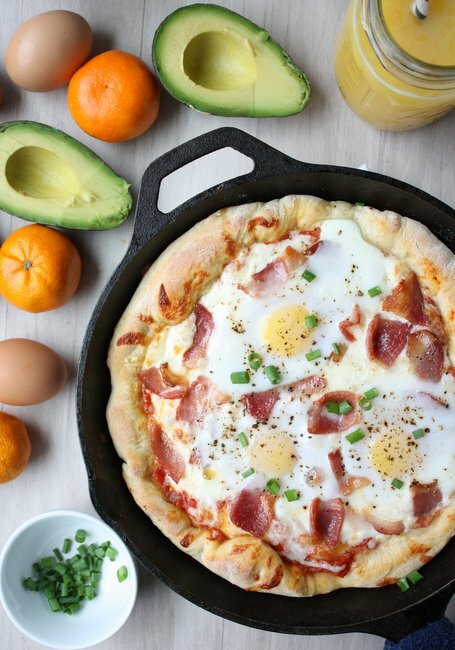 This skillet breakfast pizza is a prime example: it has been on my list for over a year, and somehow I’ve just now gotten around to it. Whoopsies! Now that I’ve made it, I’m not sure why I waited so long! 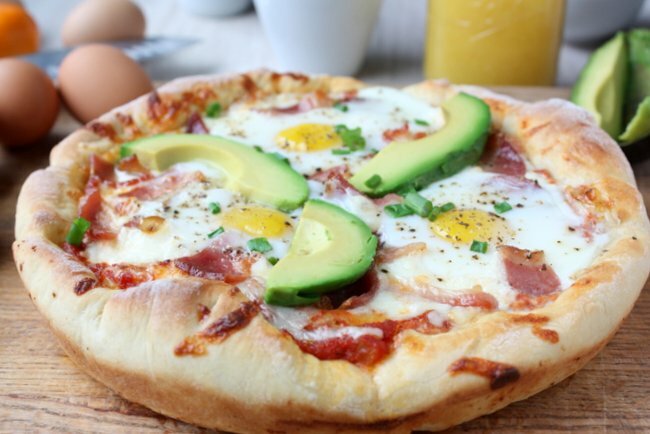 I am a huge pizza fan, so having it for breakfast is right up my alley. Yes, I eat unusual amounts of cheese. No, I’m not ashamed. I was nervous that the cast iron would be too hot, and result in a blackened crust — but was pleasantly surprised to see that it didn’t! I did make sure to work quickly once the crust was in the pan, as I could see it starting to rise from the heat. Get those toppings on quick! Preheat the oven to 400 F. Make sure your pizza dough and pizza sauce are ready to go. If making the pizza dough the night before, refrigerate for the second rise and remove from the refrigerator 1 hour before using. Cook the bacon in a large cast-iron skillet until done. Remove from the skillet and chop into large pieces. Discard the excess bacon fat from the pan, but do not wash or cool the pan. Take half of the dough, roll or throw into a large circle, and fit into the pan coming up the sides a little bit. 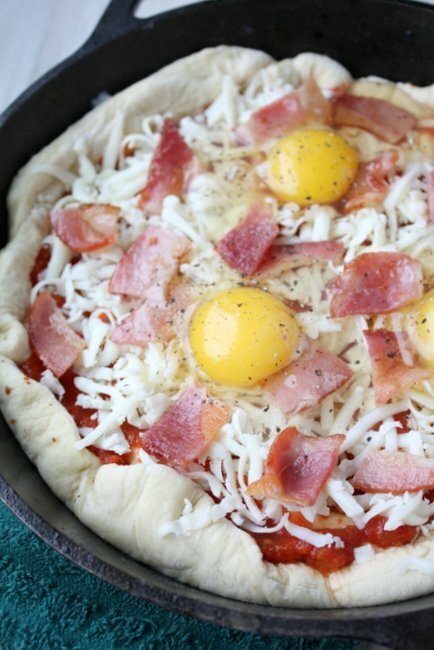 Working quickly, spread pizza sauce, layer the cheese and bacon, then make small wells in the cheese for three raw eggs. 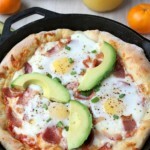 Bake the skillet for 10-12 minutes, until the eggs are set and edges of the pizza are golden. Remove the pizza from the skillet when done, and then assemble and cook the second pizza. Serve with avocado and green onions. Salt and pepper to taste. A nutritious and delicious breakfast! This looks like the perfect breakfast, a great tasty start to the day! 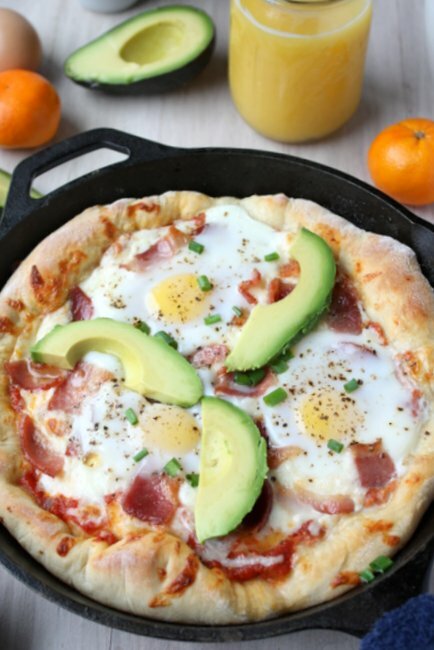 I always have a hard time finiding different recipes for breakfast and this looks delicious! I pinned this forever ago, and I’m dying to make it. The only problem is that I don’t have a cast iron skillet. Will a different oven proof skillet work ok? Or should I try to borrow a cast iron skillet from someone? I printed this recipe a while back and made it this past weekend. I cheated and purchased pizza dough and sauce because I’m basically lazy :). I made one pizza, using a large 12″ oven-proof skillet. I used yellow onions and cooked them with the bacon. My husband and I both loved it – the pizza is rich and filling so one piece held me over until almost dinnertime. We had the left-overs for dinner two days later and it was just as good as when first made. This recipe is a keeper – thanks! I have always believed cold leftover pizza to be the perfect breakfast food. This is even better! When I am out of bacon, I roast veggies in the skillet and add them for an extra health boost. I also use equal parts whole-wheat, bread and all-purpose flour. Thanks for making my mornings awesome!